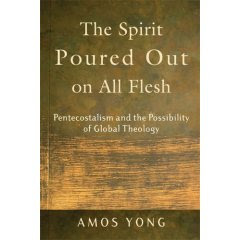 Thoughts on Amos Yong’s "The Spirit Poured Out on All Flesh"
For the past two weeks I’ve been working my way through Amos Yong’s book The Spirit Poured Out on All Flesh for my “Readings in the Theology of the Holy Spirit” class. It’s my first experience reading Pentecostal theology, and I have to say that I’ve been quite impressed. It’s been a joy to read, and has in many ways been an exercise in learning from the theology of the “other”. Last weekend at the Presbymergent event we helped organize at PTS, John Franke gave an incredible lecture about our need to become more multicultural in our theology. In order to be true to the Gospel as it is manifest in various cultures and contexts, we have to decenter traditional Euro-American theology and start learning from other ethnic and cultural and denominational theologies. So, I’m considering this reading a chance to learn from a different part of the Christian tradition – one that makes up the bulk of Christians in the global South today. Yong’s theology is in dialogue with post-modernity. Rather than taking a modernist or foundationalist approach to theology, Yong privileges scripture, tradition, the community of the church (over individual interpretation), and (obviously) the leading of the Holy Spirit over reason. As a result, truth is contextual to the worshipping community in what he calls a “shifting foundationalism that recognizes all truth claims as historically embedded without having to locate their ground on any one undeniable foundation” (p. 156). Yong’s theology is also post-colonial. As an attempt at global theology which embraces the pentecostal traditions in Africa, Latin America, and parts of Asia, Yong is working with theology that has grown in the wake of receding imperial power. Yong’s theology includes a holistic view of salvation, including social justice within the Gospel. On pages 91-98, he lists and discusses the “multidemensionality of salvation” in Christ: personal salvation, family salvation, ecclesial salvation, material salvation, social salvation (subcategorized as racial, class, and gender reconciliation) and cosmic salvation. The cosmic aspect of salvation values Creation, seeing God’s redeeming work in Christ as extending to the entire earth. Through examples like that of the Association of African Earthkeeping Churches (see previous post), Yong shows how Pentecostals are recognizing the responsibility we have to shamar the earth, to care for it as we were commanded by God to do. Lastly, this holistic view of salvation shows that Yong (and other Pentecostals like him) are not separating evangelism from social justice. He is careful to show how the Azusa St. Revival in 1906 brought together people of various races in a way which became a distinguishing characteristic of early classical Pentecostalism. The hermeneutical privilege of Luke-Acts. Yong treats the Gospel of Luke and the book of Acts as the lenses through which all the rest of scripture is read. . . . To what extent can or should we have a canon within the canon? It’s safe to say that many Protestants already do practice this to some extent: The principle that scripture is authoritative as it bears witness to Jesus Christ gives privilege to the Gospels in general, placing the teachings of Jesus as the control over all other parts of the Bible. Thus we read the Pentateuch through the lens of the Sermon on the Mount – Jesus’ authoritative interpretation of the Law. But can we safely isolate just the Gospel of Luke and its sequel as more authoritative than other Gospels because of the emphasis Luke gives to the Holy Spirit? The expectation of charismatic gifts. While this is thought by most outside of Pentecostalism to be the hallmark of the movement, Yong actually does not place too strong an emphasis on charismatic gifts such as speaking in tongues. They are not required for salvation, but at points he does say they are to be expected. If charismatic gifts such as tongues are to be expected, doesn’t this place Christians without such gifts in a second-tier? This expectation is also in tension with Yong’s own emphasis on ecumenical dialogue and theology; the goal of the book is one sense to provide foundations for a “global theology”. Altogether, I would say that this expectation should be read in the light of 1 Corinthians 14, both for the sake of recognizing the function of spiritual gifts and for the sake of ecumenism. I look forward to finishing the book in the next couple weeks, and may try to post more reflections. (I can already tell that his chapter on other religions is going to inspire some creative thoughts.) More to come . . .
How cool is that?! It may sound strange to some folks, but it at least highlights the importance of caring for Creation. It’s encouraging to see evangelical books like this coming out now as well. Perhaps we should take a lesson from our African Pentecostal brothers are serve God by planting a few trees?